All attention in the global currency markets on Thursday was undoubtedly on Frankfurt and the European Central Bank’s much anticipated March monetary policy meeting. Expectations for further easing measures were high, and ECB President Mario Draghi didn’t disappoint. As was almost universally expected, the Governing Council announced it would be cutting its deposit rate even deeper into negative territory. The deposit rate was cut, as we had anticipated, by a further 10 basis points to -0.4%. The ECB also surprised markets by announcing it would be cutting its benchmark refinancing rate to zero from 0.05%. The quantitative easing programme launched 12 months ago and was ramped up by an additional 20 billion Euros a month to a massive 80 billion Euros, higher than the 10 billion Euros priced in by the markets. The ECB will now also buy investment-grade corporate bonds, in addition to the government debt it had already been purchasing. In addition, the bank also announced it would be launching four new rounds of Targeted LTROs of four-year maturity, the rates of which could be as low as the deposit rate. This increase in monetary easing measures is extremely significant in magnitude and surprised even the most bearish of economists, sending the Euro plunging by its largest amount against the US Dollar since November. 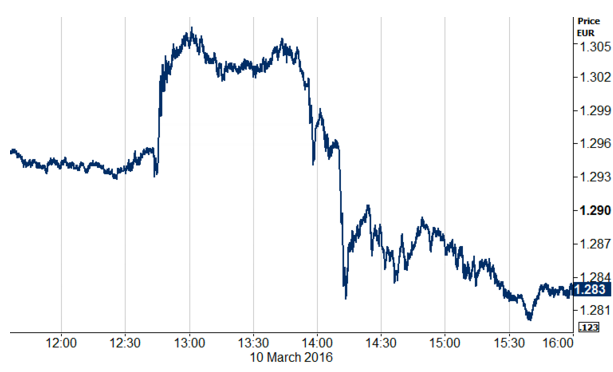 However, the Euro bounced sharply during the accompanying press conference. While Draghi reiterated rates will stay very low for a long period of time, and well beyond the timetable of asset purchases, the Euro recovered the entirety of its losses after he suggested he didn’t anticipate any further interest rate cuts. The single currency subsequently ended the press conference higher against both the US Dollar and the Pound (Figure 1). Source: Thomson Reuters Datastream. Date: 10/03/2016. Despite the rebound in the single currency, we think an expansion in the ECB’s monetary stimulus measures of this magnitude is very meaningful, and should place a large amount of downward pressure on the Euro throughout 2016. Of particular interest is the fact that the TLTRO long-term funding will be priced at the same (negative) level as the deposit rate, which means that this cost on banks’ excess reserves will be effectively paid back through them through lower funding costs. This means that further cuts to the depo rate are certainly a possibility. We therefore remain of the opinion that the single currency will recommence its gradual, long-term depreciation against both the US Dollar and Sterling, with the Euro reaching parity against the Greenback at some point in the third quarter of the year. This, in our view, provides businesses with an ideal opportunity to hedge their exposure to the Euro in anticipation of any further depreciation of the currency.